Since 1982 we have been offering top-quality products for the meat industry and gastronomy to our commercial partners in Poland and worldwide. Over the last few years, due to the big interest, the service of laser cutting has been rendered, too. The ambition of the company is that Jugema products would be made according to the cutting-edge technology using special-purpose machines. Numerically steered equipment allows to produce high quality elements used for manufacturing our products. The qualified and specialised staff pursues enlargement of the product mix by offering our Clients various innovations that allow to use the equipment in the most effective way possible. We cooperate with many trading companies all over Poland and abroad. We also have many individual clients who collaborate with our company. 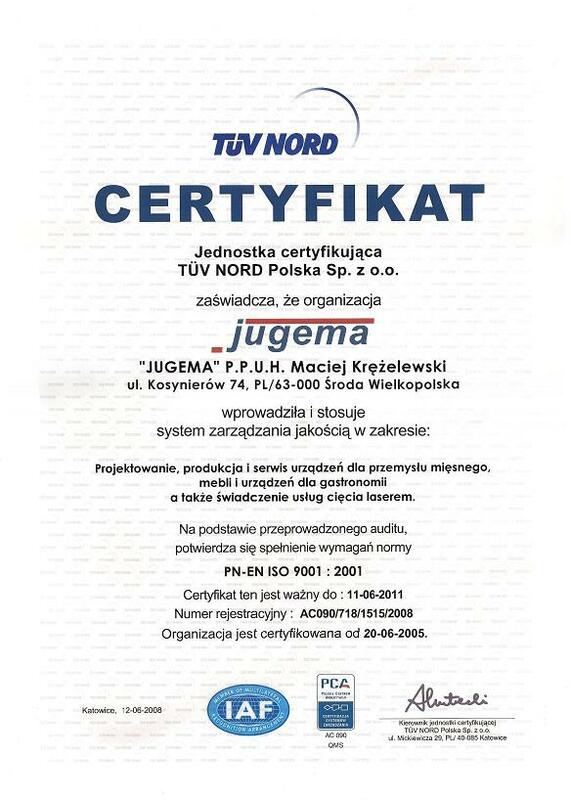 High quality of produced products is assured by the Quality Management System confirmed by ISO 9001:2000 / EN ISO 9001:2000 Certificate granted by RWTÜV SYSTEMS GmbH concerns designing, manufacturing and servicing equipment for meat industry, furniture and equipment for gastronomy as well as rendering services of laser cutting.